Event starts at 12:00pm March 17th at 1718 Ocracoke Brewing and the Parade ends at O'Bar for the winner announcements and Prize Awards. No Registration, No Entry Fees, just be present from the start of the parade until the finish at O'Bar. Louis the Leprchaun will choose the winners and award the prizes during the Ocracoke St. Patricks Day Parade Party. Be a Part of the 4th Annual Ocracoke St. Patricks Day Parade! 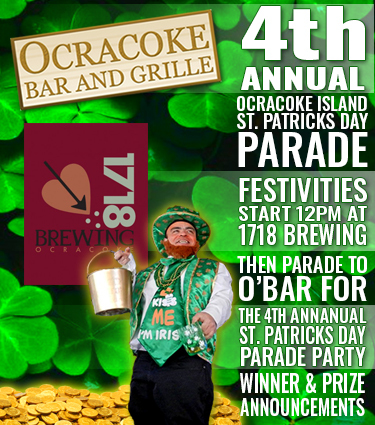 The 4th Annual Ocracoke St. Patricks Day Parade will start at 12 noon, Sunday March 17th with a Pre-Parade Party meet and greet with Louis the Leprechaun at 1718 Ocracoke Brewing. (Post your selfie with Louis the Leprechasun to the OcraockeBar Facebook page and be entered for a chance to win more cash and prizes for the Best St. Patricks Selfie photo contest). Deadline to upload St. Patricks Selfie Pics is March 20th. "Request A Vacation Day for Monday March 18th"
Now you can attend the 4th Annual Ocracoke St. Patrick's Day Parade. Now you can book your lodging for this three day weekend. Now you can spend the rest of your work day checking out what restaurants and shops you are going to visit during your three day weekend. Louis the Leprechaun will start the Parade around 1 - 1:30pm or when he feels its time to lead the parade down the road. Louis will sound a whistle for everyone who is participating to gather in a line as the parade begins moving toward Ocracoke Bar And Grille. As long as the participant is in the parade at the start of the Parade they will be considered for the prizes cash & Prizes. The parade will arrive at Ocracoke Bar And Grille approximately 1/2 mile from 1718 Ocracoke Brewing. The St. Patrick's Day Parade Party begins when the Parade arrives at O'Bar. A Full Day of Music, Green Beer, Corned beef and Cabbage with a full helping of Tomfoolery. The Parade winners will be announced during the St. Patrick's Day Parade Party. Louis the Leprechaun will choose who the Best Float, Individual or Group effort will be awarded the $550.00 Cash and other Prizes for 2nd and 3rd Place.